DNS is one of the fastest growing attack vectors because it’s essential for network connectivity, and current security solutions are not designed to protect it. Distributed denial of service (DDoS) attacks and other external and internal DNS-based threats can flood your DNS server with malicious requests, bringing down your network. These attacks can redirect users to harmful Internet destinations, exfiltrate data, and expose your customers and business to additional risks. Security technologies such as next-gen firewalls, IPS, and generic DDoS solutions do not understand DNS and are unable to prevent specific attacks such as DNS cache poisoning, DNS hijacking, reflection attacks, amplification attacks, and many others. Keep your defenses current and minimize exposure to fast-evolving DNS-based attacks. An industry first, Infoblox Threat AdaptTM technology harnesses ongoing intelligence on attack techniques from multiple sources and automatically fortifies your existing protection against new and evolving DNS threats. No patches, additional development, or configuration changes are required. Get instant visibility into attacks plus DNS server usage statistics for faster threat response. 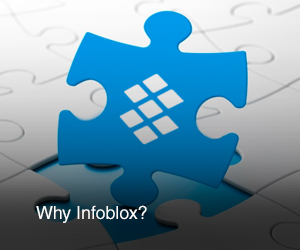 Centrally view information from a single, unified console to spot attack patterns and trends, using Infoblox Reporting and Analytics . Infoblox Advanced DNS Protection is the only solution that enables you to defend against the widest range of external and internal DNS based attacks, while maintaining service continuity.